China National Offshore Oil Corporation (CNOOC) has taken delivery of Asia’s first tugboat Hai Yang Shi You 525, designed to operate solely on liquefied natural gas as ship’s fuel. Hai Yang Shi You 525, the first of two tugs built by the Zhenjiang shipyard for CNOOC, features a propulsion package based on twin Rolls-Royce Bergen C26:33L9PG engines and a pair of highly reliable Rolls-Royce US 205 CP azimuth thrusters to ensure the tugs have rapid manoeuvring and strong bollard pull capabilities. A successful sea trial has proven an extra gain for both ship speed and bollard pull. Rolls-Royce has won a £12 million order to provide design, integrated power and propulsion systems and equipment for a highly advanced multipurpose service vessel for the Norwegian ship owner Myklebusthaug Management to be built at the Beşiktaş Shipyard in Turkey. This latest contract will see the first UT design vessel to be built by a Turkish shipyard. Around 800 Rolls-Royce UT vessels have been built or are under construction since the first one entered service 40 years ago. The vessel is a brand new design type from Rolls-Royce. 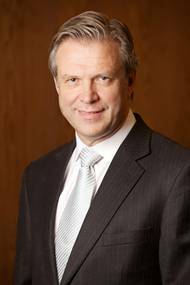 Rolls-Royce has appointed John Knudsen as President - Offshore, in its Marine business. Knudsen will transition into his new role through January 2014. Mr. Knudsen is currently President of Bergen Engines AS. He has had a key role in transforming Bergen Engines during the divestment from Rolls-Royce Marine and integrating it into the Tognum Group. Tognum AG is a joint venture of Rolls-Royce and Daimler. John Knudsen joined Rolls-Royce in 2007 and has previously held senior positions in the Norwegian telecom equipment supplier Nera ASA.